The Connecticut Junior Republic (CJR) exists because children, youth and families often need help to make positive changes in their lives. 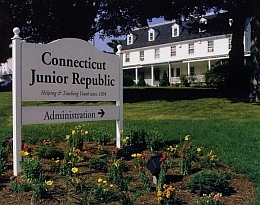 Since its founding in 1904, the Connecticut Junior Republic has helped thousands of young people go on to lead productive and fulfilled lives by providing the care, treatment and educational services necessary for growth and change to occur. The Junior Republic’s continuum of care has never been more comprehensive, accessible or needed than it is today. Assistance is provided on a daily basis through an array of residential, education, community and home-based services in 11 locations across Connecticut. Behavioral and mental health services are also provided through Wellness Centers in seven of these locations. CJR’s skilled and compassionate staff members help children, youth and families identify and utilize their strengths to meet challenges, resolve problems and relate to others in healthier, happier and more productive ways. Why Join The CJR Team?